For the holiday season, I wanted to make my co-workers something useful. Everyone has a cell-phone at work, and we are mobile developers. 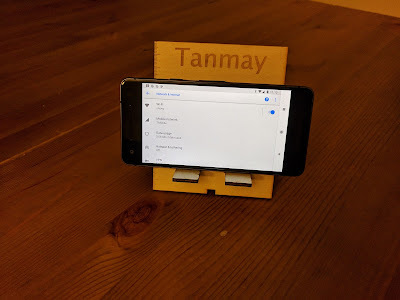 To reduce desk clutter, I thought a phone stand might be perfect. 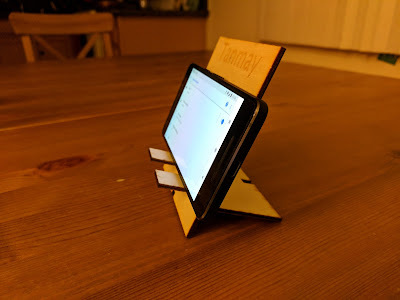 I had recently learned how to use a laser cutter, and looked around for a good project to grab from usual websites like thingiverse. Despite looking online, I didn't find anything that suited my needs. A simple material, hopefully sedate and elegant. Fewer pieces was better. I wanted to make more than 30 holders, and simplicity would allow me to make many of them. Ability to fit a wide variety of phones. Tablets would be a plus, but not required. I had cut some wood in an Epilog cutter before, so I decided to continue using 0.125 inch plywood. This was my first experience designing a physical object. 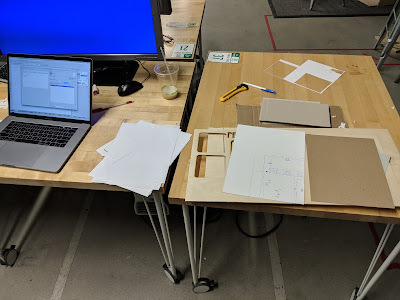 Being a true engineer, I grabbed a pencil, a pen-knife and some cardboard from discarded packaging. I started with a simple design with two pieces: one for the face plate, and one for the bottom. The bottom would poke through the face plate and hopefully lock in. I worked with various widths and lengths, to see what would hold a phone comfortably. The first cut was made from a cardboard case, and was too short, and the base wouldn't lock tight because I made the base too curved and the cardboard was too weak. Calculating the weight of a usual phone (adding 30% for future growth), the inclination, and the rough springiness from wood, my son and I worked out the lengths of the various segments. With some iterations, I arrived at two perfect rectangles: the face plate was taller, the base had long prongs that would stick out. 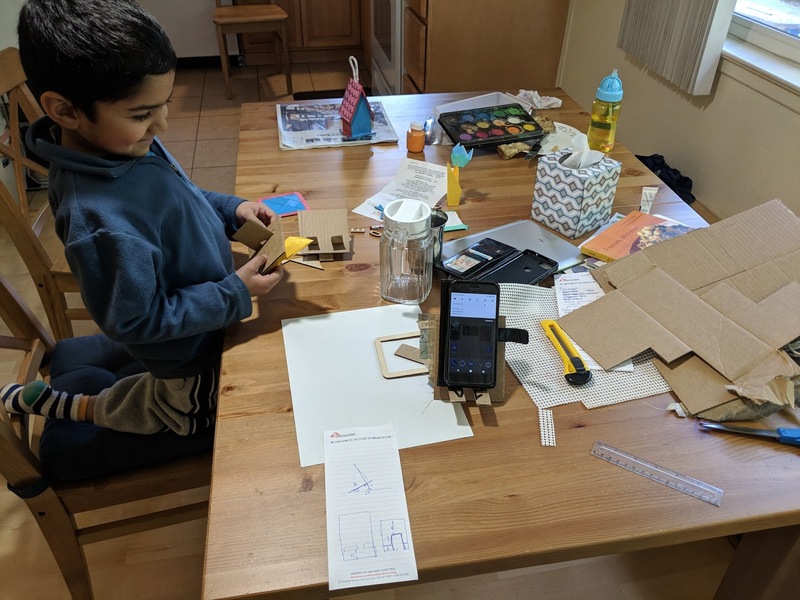 On one cardboard prototype, we were able to hold a real phone without flopping. This is the first prototype holding up a phone. That night, I drew one face plate and one base on Inkscape, learning about Inkscape as I went. To personalize them, I added a co-worker's name to be etched (marked in red) while lines in black were to be cut. Finally, 12 x 24 inches plywood at 1/8 inch thickness was bought. To confirm the measurements, the first draft was loaded up on the laser cutter with some quarter inch paper board. I added inch markings along the side to diagnose any deviations in the cut. This is the desk area as I was waiting for the cut to finish. To my utter shock, the first cut on cardboard was absolutely perfect. It measured exactly to spec, the two pieces locked together, and it held up my phone. With the success of the paperboard run, I decided to calibrate the laser cutter for engraving and make a single test run on wood to see how well it held up. I loaded up my wood, and sent the same .svg file, this time calculating laser intensity for wood instead. The power on the first run was too weak, so I just repeated the run without moving the wood. It led to a working model, this time in wood! The face plate is to the left and the bottom plate is to the right. Notice the inch markings along the left edge, still visible. This is what it looks like with a phone on it. 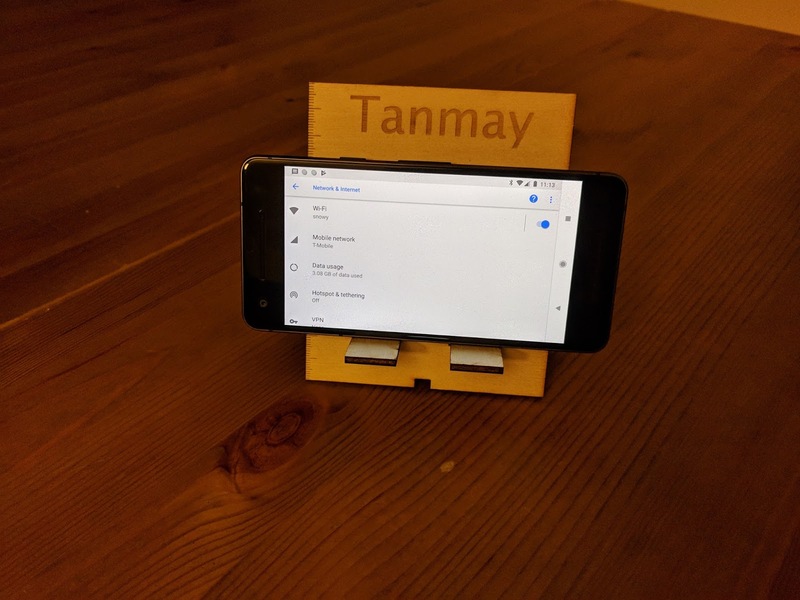 Making a single phone holder is easy, and takes forty minutes to print the face plate, then readjust origin, print the base plate, and ensure the cut is good. Making many copies without mistakes would be time consuming. I did not want to manually adjust the origin, and find where the start from. I would have to automate it to make all the holders in time for Christmas. The prongs were too short, which led to the phone sliding off. This was bad. The prongs needed to be longer. To allow for a phone charger cable, gaps were cut at the bottom of the face plate and the bottom plate. To minimize wastage and manual effort, I had to fit 30 face plates and 30 bottom plates on as few sheets of plywood as possible. Eventually, I ended up fitting the face plates together on one run, while bottom plates would go in another svg file. 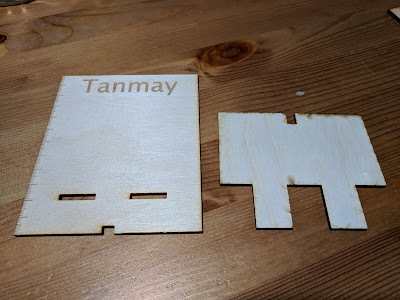 After completing #2, I realized the laser cutter might not cut perfectly near the edges of the wood, and all wood warps over time. In addition, I might not set the origin perfectly, and the board might be smaller if it was at the edge. So all sizes were reduced by a small amount to leave a thin border of wood as a precaution for these issues. A friend came over and suggested that usernames worked better than first names for our office. All first names were changed to usernames. This was a great idea since there are people with the same name. Since I had increased the prong size in #1 and reduced the overall board in #3, we'd have to create another PVT to confirm before a final production run. The inch markers were left in the final run, adding a minimalist elegance to the design. I had just enough wood to make all holders, but no spare planks if I messed up. Kids fell ill, leading to production delays. With all these lessons, three new Scalable Vector Graphics (.svg) files were created: two containing 15 faceplates each in a 3 x 5 grid. Since these had names for engraving, they had to be different files. The font sizes were reduced for longer usernames to make them fit on a line. 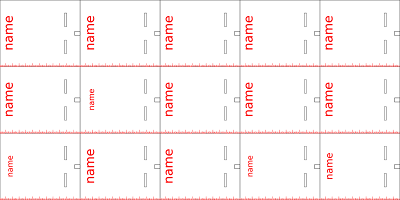 The inch markers and names are in red for engraving (less time at 100% intensity). The black lines are for cutting through (more time at 100% intensity). The bottom plates were not personalized so a single sheet with 21 bottom plates (3 x 7 grid) was made. Ordering spare wood would have been wise, but I aimed for perfection instead. Finally, I went over to the laser cutter with wood, .svg files, paperboard, pen-knife and tools. After confirming that the new measurements with longer prongs and overall reduced size still held up a phone, I loaded up a full sheet of 12 x 24 inches plywood at 1/8 inch thickness. Cutting took 10 minutes, and just to ensure a precise cut, I ran the job again with just the cutting again. Even so, some sheets were warped around the sides and some plates were loosely attached and had to be scored with a pen-knife to separate. Here's a video of the cutting in progress. You can see the inch markings along the left wall as the cut lines up perfectly against them. The bottom plates were faster, having no engraving. Here's the start of the bottom plate run. 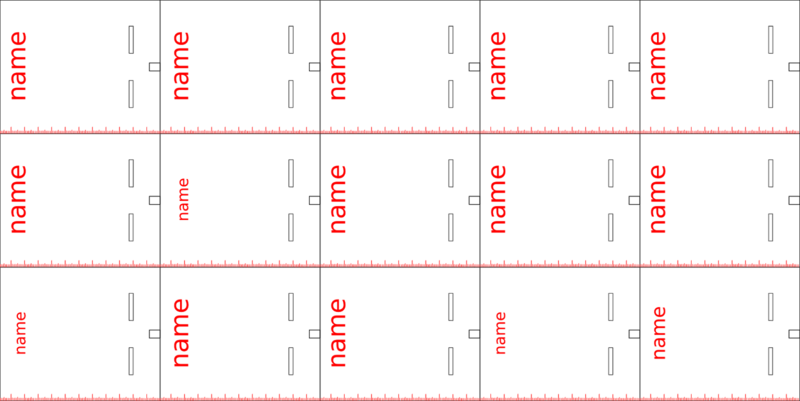 You can see the narrow border left, which was to allow for some error while setting the origin of the run. My co-workers got a personalized phone holder each, and I still had wood left over. There was one hilarious mistake where a username were incorrectly spelled, and another where a natural knot in plywood marred the username. These face plates were cut again, individually. With that, production was complete. The delight was not just in having a personalized gift for everyone, but the satisfaction of a job well done.